Pennsylvania’s 18th Congressional District, a slice of pro-President Donald Trump territory located just south of Pittsburgh, is poised to flip from Republican to Democratic in today’s special election. Democrat Conor Lamb, a 33-year-old former Marine, may snag the seat from Republican Rick Saccone, a 60-year-old state senator. Or so thinks former Vice President Joe Biden, who visited the Pittsburgh area last week to stump for Lamb. New York Times reporter Jonathan Martin reminded Biden at the event that in an 18th Congressional District filled with old coal miners and steelworkers, many of whom voted for Trump in 2016, the odds are against Lamb. The outcome of today’s election is almost totally inconsequential in the short term. It’s a special election happening roughly eight months before the seat will be open again. The seat won’t significantly change control of the House — unlike the Senate election in Alabama, which brought Republicans down to just a 51-49 majority. And it’s in a district that won’t even exist in November, since courts recently ruled the previous Congressional map for Pennsylvania unconstitutional. But this election is a litmus test for future midterms. A loss here would indicate that the voting base that gave Trump his win — blue-collar workers in the Rust Belt — are second-guessing their votes for him, setting the stage for a blue wave in upcoming elections across the industrial northeast and Midwest. It’s impossible to see what happens today outside of the context of Trump’s policies and administration in Washington, D.C.
Republicans are worried about losing this election, and rightfully so. Recent polls show that the race is a toss-up, with the spread between the candidates within the margin of error. Partially because of this, the party’s treating the election with more importance than your average race in the House of Representatives. The average winning candidate for the House in 2012 spent $1.6 million on campaign costs. 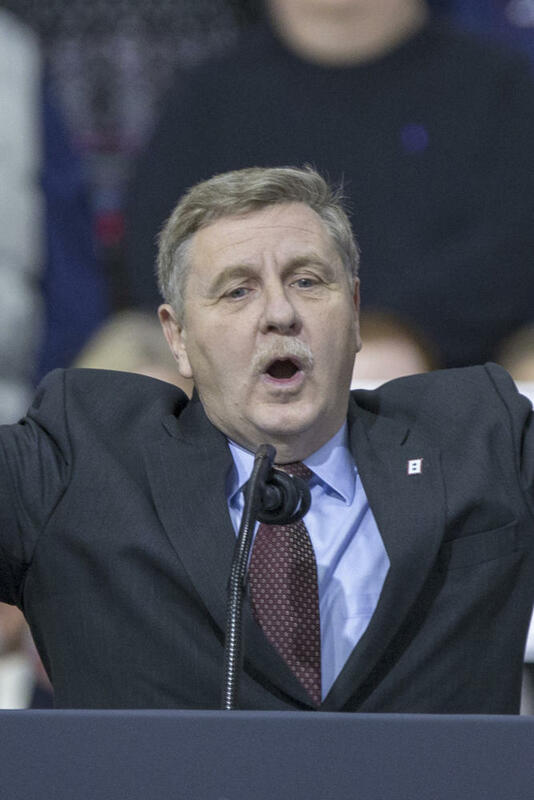 By the end of February, Saccone’s camp had spent $9.7 million, outspending the Democratic candidate almost tenfold. More than $900,000 of this funding comes from the Republican National Committee. Republicans haven’t just dedicated funds to the election — they’ve dedicated the time of their party’s officials, too. Vice President Mike Pence visited the district once last month, and President Trump himself has visited twice, most recently this past weekend. There’s only one explanation for this level of activity from national Republicans. They are worried industrial workers in the Rust Belt are questioning their allegiance to the Republican Party. This trend is difficult to explain. After all, the economy is doing great by most metrics, and blue-collar workers in particular have seen legislation proposed that’s presented as being designed to benefit them, such as the recently ordered tariffs on imported steel and aluminum. But blue-collar workers appear neutral about the progress made under the administration so far. In an article earlier this month for The New York Times, journalist Michael Tackett met with industrial workers in Ohio. Most of them were largely apathetic about the meager paycheck increases since 2016, which maxed out at $40 every two weeks. This supports the idea that the working class is questioning its support for Trump. If this trend holds, it could have devastating impacts on Republican control of Pennsylvania’s Congressional delegation. Currently, 13 of the 18 House seats in the state are controlled by Republicans. This number will likely change by the end of 2018 due to redistricting, but the numbers could shift even more if industrial workers in western Pennsylvania change their voting habits. A change like this would also have an impact on state-level elections. Both Gov. Tom Wolf’s and Sen. Bob Casey’s seats are up for election this November, and these seats are vulnerable due to Trump’s win here in 2016. With stronger support from the working class, however, these seats could remain in the hands of Democrats. The impacts of a Democratic win in the 18th Congressional District could extend beyond the boundaries of the district. Trump won the 2016 election in part because of his unexpected wins in the Rust Belt, especially in Wisconsin, Michigan and Pennsylvania — states that hadn’t gone red since the 1980s. This flip was due to blue-collar workers turning out in force to vote for Trump, pushing these states over the edge. But a change in the 18th Congressional District among the same voter base could indicate a shifting national trend among industrial workers that might be able to change the outcome of the 2020 presidential election. And it would have an impact on local politics in these states too. Wisconsin, Illinois, Michigan and Ohio all have Republican governors, partially due to their support from the same voters. Some of these governors are term-limited come November, and others won their elections by a relatively small margin, making a change in party control within the states possible. A similar change could happen with House and Senate seats, too. The special election may hold few direct consequences in the near future, but this election will serve as the canary in the coal mine for upcoming elections. As the results come in tonight, Republicans will be holding their breath — hoping that their worst-case scenario is not realized. And for those who oppose Trump and his agenda, there’s no better time than now to make it known.